Oral oncolytics represent 25% to 35% of the drugs in the oncology pipeline.1 They are patient friendly, allow patients to manage their treatment, and overall, have a less disruptive effect on patient's everyday lives. Recent advancements in the treatment of multiple myeloma (MM) have led to significant improvements in patient outcomes, including unprecedented survival rates. Treating cancer with oral medications that are taken at home sounds like a great idea, and it is, once adherence barriers are addressed. Great advances have been made in our understanding of how myeloproliferative neoplasms (MPNs)-essential thrombocythemia, polycythemia vera, myelofibrosis (MF)-result in overproduction of inflammatory markers, according to Holly L. Geyer, MD, Assistant Professor of Medicine, Division of Hospital Internal Medicine, Mayo Clinic, Scottsdale, AZ, and colleagues. With recent evidence pointing to a link between chronic inflammation and Philadelphia-negative myeloproliferative neoplasms, essential thrombocythemia, polycythemia vera, and myelofibrosis, Hans Carl Hasselbalch, MD, DMSc, and Mads Emil Bjorn, MD, PhDc, Department of Hematology, Roskilde Hospital, University of Copenhagen, Denmark, recently published a review article purporting that myeloproliferative neoplasms are inflammatory diseases. Welcome to our first newsletter in the Conquering the Multiple Myeloma Continuum series, which focuses on adherence to oral medications in patients with multiple myeloma (MM). In this first newsletter, you will learn about some of the major causes of nonadherence that patients and their providers face. IDH mutations have been observed among various groups of patients, including those with glioblastoma multiforme, grade 2 and 3 gliomas, and secondary glioblastomas, as well as patients with acute myeloid leukemia. However, limited data exist among patients with Philadelphia-negative myeloproliferative neoplasms. Although there have been several trial-based studies on the use of ruxolitinib in patients with lower-risk myelofibrosis (MF), Keith L. Davis, MA, Senior Director of Health Economics at RTI Health Solutions and colleagues sought to conduct a study in the real-world setting. Washington, DC-The COME HOME initiative, a 7-member oncology medical home practice partnership, has documented significant reductions in hospitalization rates, inpatient days, and total cost of care of approximately $5 million over a 6-month period, said Barbara L. McAneny, MD, at the Fifth Annual Conference of the Association for Value-Based Cancer Care. 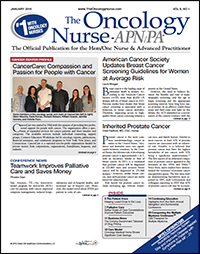 Boston, MA-Family- and patient-related factors were identified as the most significant barriers to early end-of-life discussions, as well as to the timely discontinuation of cancer-directed therapies in the palliative setting, according to the results of a multicenter survey of oncologists in Ontario, Canada.